You don't have to be a fan of AMC's Mad Men to be interested in the Old Fashioned cocktail. Even though it's Don Draper's favorite, you too can make this one like a Madison Avenue executive. The fact is, the Old Fashioned comes from an era long before Don started drinking. It's always regarded as a classic, and indeed, along with the Sazerac, it is probably one of the earliest cocktails to be created. 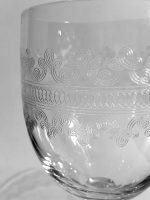 The original definition of the cocktail was first printed in 1806 when it was described as "spirits of any kind, sugar, water and bitters." The Old Fashioned perfectly fits these requirements, although today the word cocktail is used to describe virtually every variety of mixed beverage. Drop a long, wide slice of orange peel (avoiding the white pith) into an old fashioned or rocks glass. Donate simple syrup and Angostura bitters. Carefully press the peel in the bottom of the glass with a muddler to press out the essential oils, not to break the peel apart. 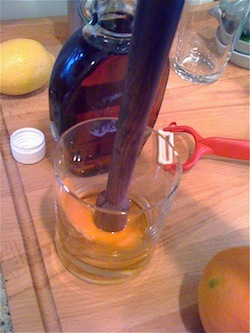 Move up and down the peel to extract the oil, then add the bourbon. Add several large ice cubes and stir. As the ice melts, add more cubes and keep stirring until chilled. This will also take the edge off the spirit and bring out the combined flavors and armoas. True of many classics is the importance of bitters. If that intimidates you, it might help to understand a little more about bitters and the role they play in mixology. Historically, bitters were (and still are) taken medicinally. 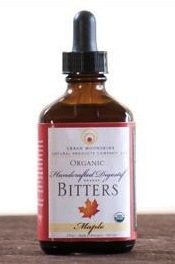 In many cultures, potable bitters are consumed because they help stimulate digestion. A bitter aperitif will stimulate the appetite. That's because the moment something bitter hits your tongue your mouth waters and your body prepares for something that it senses may not sit well. In nature, many poisons are bitter, so it's not hard to understand that bitter flavors trigger a bodily reaction that really gets the juices flowing and can result in smoother digestion. Taken alone, bitters do typically taste, well, bitter. Their flavors are often a result of concentrated tinctures—herbal extracts—sometimes in an alcohol base and other times using a burnt sugar solution. The more complex the flavor elements that go into a particular type of bitters, the better. And although this is how bitters get their name, the important thing to recognize is that they are rarely consumed alone and are often used in relatively tiny proportions. For example, a dash is really only just a few drops, and with so little added to a recipe, they are not going to make that drink bitter. The benefit is that their concentrated flavors will open up and "season" a cocktail—something akin to the way salt and pepper enhance the flavor of soup—transforming it into something complex and amazing! Today, there are several types of bitters out there. Angostura Bitters, which is widely available, has a clove-like aromatic character to it. If you only own one type of bitters, this is probably what you have. If you live in New Orleans, you probably know all about Peychaud's Bitters. This is an old formulation with a completely different flavor profile that shows up in many cocktail recipes. Then, there's Orange Bitters. Orange Bitters almost disappeared in the 1960's, but fortunately, we now have many versions of this to choose from. It just gets more diverse from there. You can now find Peach, Grapefruit, Cherry, Mint, Chocolate—the list keeps growing! Better bars and adventurous mixologists are even making their own bitters in order to create cocktails that are truly unique. One of the joys of experimentation is that by merely adjusting the type or combination of bitters in a recipe, you can completely transform a cocktail. It's amazing that an ingredient added in such a small quantities can have that effect. 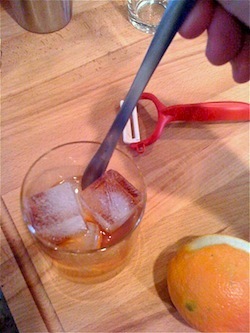 A perfect example is the following variation on the Old Fashioned cocktail below. Not long ago, I received a shipment of organic bitters from a company called Urban Moonshine. I have been using their Citrus, Original, and Maple bitters with great success. So, I decided to create a variation on the Old Fashioned using their hand-crafted Maple Bitters. I replaced the sugar (simple syrup) with pure maple syrup to sweeten this version of the classic cocktail. Then, in order to really elevate this one, I decided to indulge, using The Macallan 12-year Scotch as the base spirit. The Macallan has a wonderful caramel flavor that works nicely with maple, and the blend of orange peel with the bitters makes this cocktail heavenly. I think Mr. Draper would approve. Cut a large piece of orange peel avoiding the white pith. Add it to an old fashioned cocktail glass. Add 1/4 ounce of real maple syrup and 2 dashes of maple bitters. 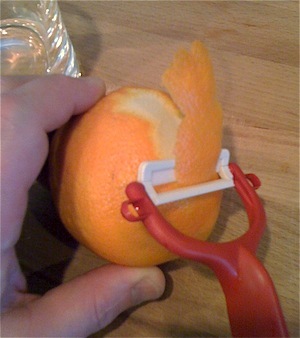 Press the orange peel along its length with a muddler. Don't smash the peel into pieces, just press it to to express the oils from the zest. Add 2 ounces of The Macalllan 12-year-old Scotch Whisky. 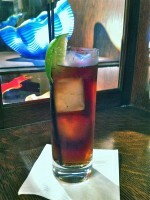 Add several large ice cubes and gently stir the drink. As the ice begins to melt, add more cubes. Add sip straws and serve. Dilution is an important element in this cocktail, but using large cubes will allow you to control the melt rate with stirring and large ice will also stay solid longer as the cocktail is consumed. 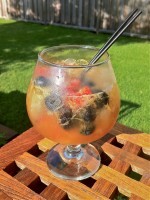 You could also mix your Old Fashioned in one glass, then strain it into another using decorative ice. Here's an perfect opportunity to use one very large chunk or an ice sphere! This delicious version of the Old Fashioned demonstrates that it's OK to experiment. Here, I took the classic recipe in a direction that actually doesn't stray too far from home. Using maple syrup instead of simple is easy enough, and swapping the bourbon for Scotch worked because of the unique flavors in The Macallan. You could do something similar by trying another type of bitters, using rye or some other type of whiskey, or even explore other ways to sweeten the cocktail—the possibilities are endless. Just try to keep the flavors in balance and you could create a personal favorite. If you do, post a comment and let me know what you tried. 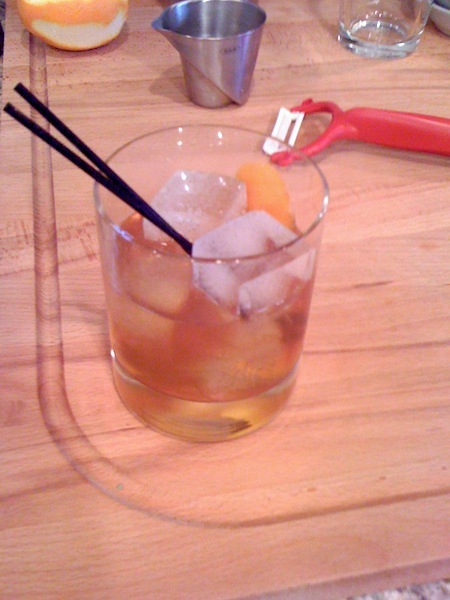 The Old Fashioned was my grandfather's usual tipple — he'd always make them at Christmas. I had no idea what was in it, except for Angostura Bitters. Thanks for this! I've been on something of an aged rum kick lately, and rum old-fashioneds with mole/orange/ango bitters is a terrific variation on this classic. I never knew rums had such depth of flavor and this drink with the bitter accents higlights it well. Thanks for posting! Aged run is definitely a delicious alternative to whiskey when it comes to aged spirits. Anyone who thinks of silver rum from a few popular brands when they consider rum as a whole is missing the best of what rum has to offer. Most people have a lot to learn about rum simply because there's so much to learn! Just by considering a few different places of origin can open your mind to some of the possibilities without even spending a lot of money.